For returning teachers and librarians, September is typically a month of renewed energy and fresh starts. Yet the late summer demonstration in Charlottesville and its aftermath left many of us facing the 2017-2018 school year fearful, overwhelmed, and exhausted. Doing nothing, I knew, was not an option. Silence, particularly the silence of white educators in the face of violence, would speak volumes and only encourage more hate. However, there is no road map for librarians who refuse to remain silent, no clear solution for how to behave professionally. As educators, I believed (and believe) that we have a responsibility to confront issues of race and equality. But where to begin? And what can school librarians in particular do to serve our school communities? I believe that librarians’ unique responsibilities to school communities can be framed in terms of the daily choices we make as professionals to provide service, support, and safety. 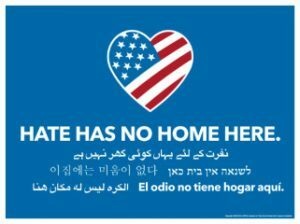 The library is, after all, our classroom, and our positions as librarians within the school give us a great deal of power to confront hatred. Because of our unique perspective, we see students across grade levels and subject areas. We are able to connect teachers not simply with resources for curricula, but with one another in order to foster collaboration and communication. The library space is a center for faculty, staff, and students to come together to ask hard questions and seek just answers. By curating space and resources, but also provoking thought and conversation, librarians are able to make important interventions in a political climate of hatred. The library is our classroom, and there should be norms of conduct and respect, diversity, and tolerance. Pay attention to social and cultural power dynamics in the library setting. Intervene strategically with an eye toward equity, inclusion, and diversity. If you overhear or see something, jump in. Addressing tolerance and inclusiveness begins in our library spaces. Think critically about spaces, pedagogy, and curricula. Chicago Public School educator Xian Barrett’s “7 Ways Teachers Can Respond to the Evil of Charlottesville Starting Now” is an excellent place to begin. So much of our literature address the possibilities and challenges of collaboration with teachers. In promoting social justice, teachers, librarians, and administrators can do more in concert with one another than they can through individual classroom efforts. Be the one to start a school-wide conversation about how to address the world post-Charlottesville as fellow educators. Feature authors of color in book lists, reading groups, and displays. The library should be a place where marginal voices are brought to the center. Make book and resource displays diverse, even (and especially) if diversity is not the theme of the display. Don’t forget that your school community extends beyond the adults students interact with in the classroom. Include janitors, office workers, bus drivers, and other school personnel staff by reaching out to them with resources, or by making it clear that library resources are available for all staff, not just faculty and students. Be interactive! Use polls, surveys, bulletin boards, discussion groups to reach out to the school community, ask provocative questions, and give them an opportunity to respond. Make the library available for inclusive programming, presentations, reading groups, and discussions. The library is a central place for all members of the school community to connect. Librarians facilitate that connection. Connect with student groups within the school who share the goals of diversity and equity. Invite them to design or contribute to displays, discussions, and other library programming. Media literacy is more important now than ever! Teachers and administrators are more likely to be receptive to what we have to offer students as librarians. Be prepared to take the lead in school-wide discussions of how to help today’s students think critically and be more media-savvy. Please feel free to add more suggestions and resources in the comments! I look forward to further discussion. ‹ Counting Down to Standards Release! This is wonderful. I would like to share this with my librarians group. May I have your permission to print this for them? Yes, you can print the post and share it with your librarians group. Could you make a correction on the Greenberg article under #10? It links to the article in #2. Thanks for a thought-provoking article and for the list of resources. Thanks for letting us know about the wrong link for that resource. I’ve updated the link with the correct URL.